Lakȟótiya Woglaka Po! Speak Lakota! 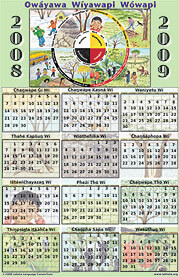 As 2008 draws to a close the Lakota Language Consortium introduces several new language products. Our publishing goal for the next year includes the development of the Speak Lakota! Level 3 Textbook, a much sought after Conversational Lakota Audio CD, and the first reprinting of our New Lakota-Dakota Dictionary, initially published in August 2008. 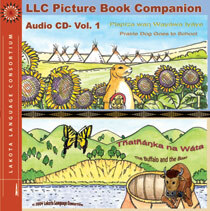 Take a look at our new LLC Picture Book Companion Audio CD-Vol. 1 and the 2008-2009 Calendar available now. 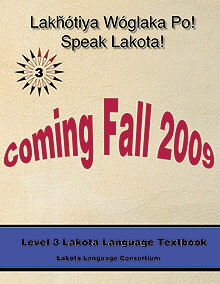 The Level 3 Lakota Language Textbook is part of a series of materials, including audio CDs, designed to increase student vocabulary by 300 to 500 words, while addressing many new and important thematic units that are important to the Lakota culture—notably, addressing relatives, expressing emotions and participating in cultural events. The LLC received a generous grant from the Administration for Native Americans to fund 50% of the development of the Level 3, and Level 4, textbooks. The next step is to complete, publish and distribute the Level 3 textbook. 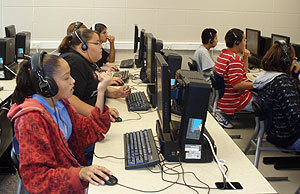 An estimated 4,000 to 5,000 Lakota students will soon be ready for Level 3 instruction. Available to the public in August 2009. Imagine plugging in a Conversational Language Audio CD on your way to work, school, or just anytime—you would Lakȟótiya Wóyaglake in no time! We’ve received a lot of positive responses about this CD that will come out in the summer of 2009. Although we’ve written about the New Lakota Dictionary (NLD) recently it’s worth mentioning again because we’re planning on a first reprint--ASAP! Since we published the NLD in August 2008 we’ve sold or distributed for free approximately 2,500 volumes globally, about 1,600 of those going to various Lakota and Dakota people, schools and organizations. The 20,000-word Dictionary is an indispensable resource for both advanced language users as well as beginning students within the Lakota-Dakota speech community and beyond. If you haven’t already, take a minute to check out our two picture books—now with a companion audio CD. The LLC Picture Book Companion Audio CD-Vol. 1 is the audio companion to two LLC Picture Books: Prairie Dog Goes to School and the Buffalo and the Boat. The prairie dog story is modeled after a classic Lakota tale and the story of the buffalo is an entertaining story. Both the picture books focus on helping children learn basic verbs, sentence structure as well as animals and numbers. The companion audio CD supports and engages students in the learning experience. A picture says a thousand worlds. We keep a big box filled with rolled up Schoolroom Posters in our distribution room to meet the demand of students and teachers. These glossy posters are of high quality, very informative and beautifully done. The posters are an effective and fun way to learn and they reinforce the content in the language textbooks and CDs. One of the fluent Lakota language speakers stated, “I am fluent in my language but no one has ever taught me how to teach my language.” That has been the goal of the Lakota Summer Institute held at Sitting Bull College this June 2nd to 20th. The Institute is sponsored by the Standing Rock Sioux Tribe, Sitting Bull College, Prairie Knights Casino, and the Lakota Language Consortium. The 23 participants have come from as far a field as the Rosebud , Cheyenne River, and Pine Ridge Reservations, as well as from the K-12 schools on the Standing Rock Reservation. Three classes have been held daily from 9:00-4:00 PM for the last three weeks and provide credits towards Lakota Language teacher certification. Teachers new to the Institute took a class in Lakota phonology and writing. The class helped teachers improve their ability to teach the unique sounds of the Lakota language to predominately English-speaking kids as well as to teach the consistent standard writing system. Advanced teachers were able to take a class in Lakota morphology, which helped improve their ability to teach the way Lakota words change when conjugating verbs and in constructing sentences. All teachers also took an afternoon class in language teaching methods. This class focused on improving general language teaching skills with methods adapted from the teaching of other languages. Teachers learned how to use dialogues, games, writing, and reading to help students learn the language more effectively and to make it more interesting. 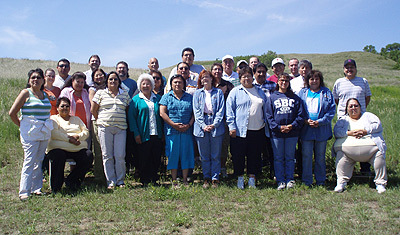 Institute trainers included instructors from Sitting Bull College, the Lakota Language Consortium, Indiana University, and the University of Minnesota. The Institute has been a particularly important way for the tribe and areas schools to begin addressing the problem of providing professional development in second-language education for Lakota teachers. These educational opportunities have never been available in the region, and the Institute marks a new commitment to improving Lakota language teaching on Standing Rock and neighboring reservations. In addition to learning new and effective techniques for teaching their traditional language, Lakota teachers are also getting to know teachers from other schools- forming bonds and creating networks. There is a great hope that the Summer Institute will be the start of a new era in the teaching of the language. Tom Beauchamp, LLC’s communications assistant caught up with Karen Little Wounded, LLC’s new Education Coordinator via email for an interview on the latest news in Lakota language education. Karen has been very busy giving pre-tests to dozens of schools on Lakota Levels 1 & 2. We asked Karen if she would show us what it’s like to be our education coordinator at such an interesting and busy time. Luckily, she agreed! Karen has a keen eye and easily illustrates what’s going on during the testing of proficiency in Lakota with interesting detail and insight. TB: What’s going on: what’s the testing cycle; what’s happened; what’s happening now and where does it all end? KLW: During the school year, the participating schools are pretested and post-tested on their knowledge and use of Lakota language. The pretesting is conducted during the fall months and the post-testing is conducted during the spring months. It is a free service offered to the schools and the outcome consists of comparative data analysis of class and school averages. In addition, an assessment of observations in methods, classrooms, instructors, technology, curriculum and other available resources are given to each participating school. The data will determine an increase or decrease in knowledge or use of the Lakota language by reviewing the same data from school year to school year. The testing began on the Standing Rock Sioux Reservation, the Cheyenne River Sioux Reservation, the Oglala Sioux Reservation and a visit to one school on the Rosebud Sioux Reservation. There were twenty-three schools participating in the Level 1 Pre-Testing. There were thirty-four schools participating in the Level 2 Pre-Testing. The Level 2 Pre-Testing Results were exported, reviewed, formulated into data charts for the schools to review during the Lakota, Dakota and Nakota Language Summit in Rapid City, South Dakota. The Level 1 Pre-Testing Results are completed and are currently in the process of preparation for distribution to the participating schools. The scores were grade appropriate with considerations of availability of curriculum or other resources, how long the curriculum had been in existence at each school, instructors and allowed time for teaching the language. It was interesting to note that even though the student might not have had extensive learning of the language, the majority of the students made a connection to the pretest and had a score, they were able to recognize words and match them to a picture. TB: What do the teachers and students think? Are there any good stories to share? KLW: There were numerous variances within each school besides the obvious, the type of school whether it was BIA, Tribal, Public or Parochial, there were the number of instructors, some had their own classrooms, some traveled from classroom to classroom, some had adequate curriculum resources and some are in need of curriculum resources. Methods were different, some taught the female and male students separately, some integrated the language into the regular subjects such as history, math, science, the amount of time spend teaching the language varied. Some instructors had teacher training and some are yet to be trained in the curriculum instruction. A few schools had use of excellent technology and a few schools use outdated technology. No matter what school was being screened, the reaction of the students was the same. The excitement of hearing the Lakota word and matching the word to the appropriate picture was always the initial response. They would laugh, repeat the word but continue on and at the end would ask each other, what did you get? Most times, the students would ask, can we take it again? The interest or passion for learning their native language is in the students and should be taken advantage of. More instruction time, more instructors and the more they are immersed in the language curriculum and resources better results will be achieved meaning fluent speakers. It was an educational and enriching experience traveling from reservation to reservation, from school to school, meeting committed individuals not only to education but to the teaching of the Lakota language. I look forward to returning to each and every school and improved scores and averages. TB: Who does the testing benefit and why is the testing important? KLW: The testing benefits the students who are the primary target for teaching the language. In turn, the schools will benefit as this screening tool can provide an insight on how they can best teach the students their native language. The respective tribes will then benefit through revitalization and preservation of the Lakota language and the future of each nation. This is why the testing is important, through this free service, a screening tool for schools to use as they see fit to design, redesign or improve their efforts in teaching the language is offered. The position of Education Coordinator is the type of job opportunity I was seeking which is interesting, educational, opportunity to travel and meet new people and, most importantly, an opportunity to be involved in the preservation and revitalization of our beautiful language. I am from the Cheyenne River Sioux Reservation and reside in Eagle Butte, South Dakota, although, my hometown is Dupree. I received my Bachelor’s of Science Degree in Management and, currently working on my Master’s Degree in Lakota Leadership and Management through the Oglala Lakota College. It was an honor to visit these schools, to observe their level of commitment, not only to education but to the teaching of the Lakota language. It is my goal to assist the schools in achieving their level of proficiency in the Lakota language by providing the opportunity to acquire our curriculum and other resources, training and positive support. We are pleased to announce that the New Lakota Dictionary: Lakȟótiyapi-English / English-Lakȟótiyapi & Incorporating the Dakota Dialects of Yankton-Yanktonai & Santee-Sisseton has begun publication and will be broadly available on July 15th. The Dictionary is the result of 25-years of work with over 300 speakers from all representative speech communities of the Northern Plains region, including Minnesota, North Dakota, South Dakota and Nebraska. Descriptions of word-stems and stem nests. 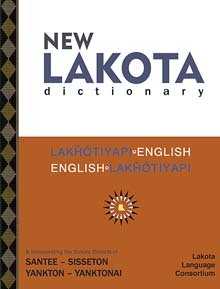 The publication of the NewLakota Dictionary was made possible through the generous contributions of the Dakota Indian Foundation of Chamberlain, SD, the Tatanka Oyate Foundation of Germany, the Grotto Foundation of Minneapolis, MN, the Shakopee Mdewakanton Sioux Community of Lake Prior, MN, and the Standing Rock Sioux Tribe. We are pleased to offer a follow-up on the three Lakota students who are enrolled at the University of Colorado Linguistics M.A. 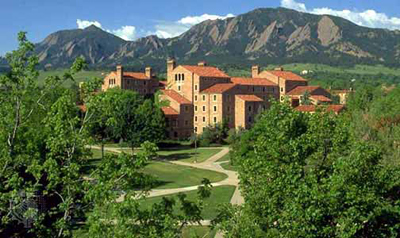 program program at Boulder, with scholarships funded by the National Science Foundation. Sidney Bad Moccasin (Rosebud Reservation), Gwendolynn Holmes (Cheyenne River Reservation), and Babette Thin Elk (Pine Ridge Reservation), who began their studies in August 2007, will soon complete their first year of the three-year program. They are taking classes in general linguistics, phonetics, phonology and semantics, and are learning to apply their new knowledge to an understanding of their own language. In May they will help administer the Level 1 Posttest at schools in South Dakota. In June they will be attending a two-week workshop at the University of California, Santa Barbara, to learn techniques for recording and preserving the language as it is spoken today. This important study will be the first extensive non-print documentation of the language, during a period when we continue to lose native speakers at a rapid rate. By training native speakers to be researchers, UC provides some highly qualified people to undertake leadership roles both inside and outside the Tribe. The project contributes substantially to the possible survival of the Lakota language, and we look forward to following the progress and contributions of these graduate students. Moccasin, Holmes and Thin Elk are being mentored by Prof. David Rood, who was responsible for the NSF funding and has done a great job in keeping the Project focused as he works to support students in every aspect of their academic careers.